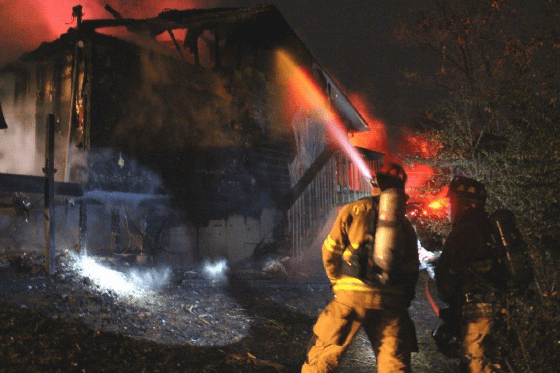 Oak Ridge, Tenn. — Early Saturday morning fire destroyed a rental home at West Outer Drive. The fire was reported at approximately 4:25 a.m. on October 31, and the Oak Ridge Fire Department (ORFD) arrived on scene finding fire coming through the roof of the house. The home was unoccupied at the time of the fire and the cause is still under investigation. There was also heat damage to the house west of the fire. The Oak Ridge Electric Department (ORED) responded and replaced the electric meter of the adjacent home, which was cracked by the intense heat of the fire. The ORFD was on the scene for approximately 4 hours conducting the fire investigation. There were no injuries reported.